Manufacturer of a wide range of products which include hold down action clamps for chemical processing. Being the reckoned names in the industry, we offer wide array of Hold down Action Clamps for Chemical Processing. Our entire product range is functionally advanced and sturdy in construction. Our entire product range is technically advanced. Moreover, we offer them in stipulated time frame. 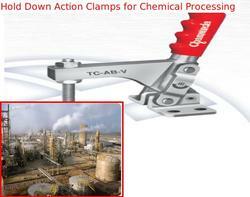 Looking for Hold Down Action Clamps for Chemical Processing ?